Onward State published a lengthy story today on the 1981 Undergraduate Student Government election. Well, it wasn’t as much about the election as it was about the ticket that came in second: Wimpy the Gerbil and Fredrick A. Schiller ’83. Written by someone who worked on the campaign as the “West Halls Press Secretary,” the story talks about how a gerbil very nearly became the USG President. The ballot managed to pull in 1,432 votes while the ballot that came in first received 2,299. The author claims that a number of measures were taken by the USG Elections Committee to make sure that Wimpy didn’t win. Wimpy was viewed by many as a protest candidate of sorts who managed to get his way onto the ballot. 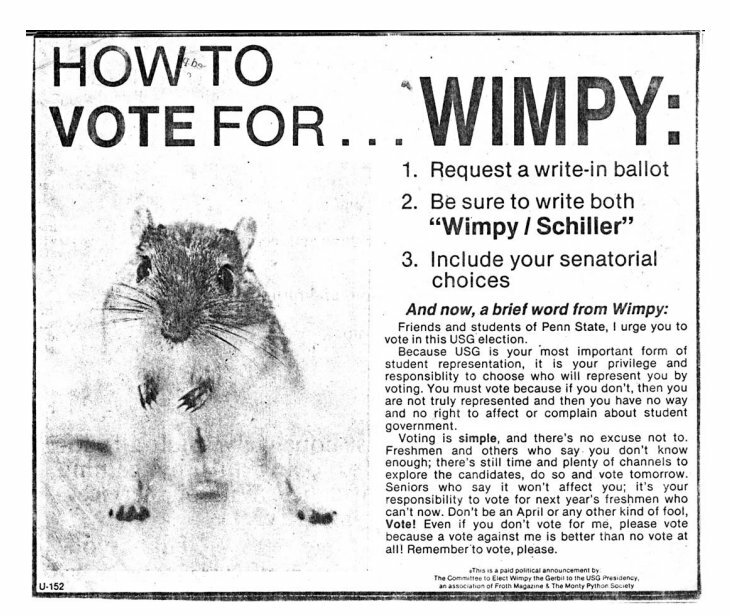 Wimpy’s official platform – one that the author didn’t necessarily agree with due to its being “patently impractical” – was that he’d turn USG into the purest form of democracy, meaning it would not make any decisions on legislation until after the entire student body was polled. Set aside some time to read this story. It’s at once silly, bizarre, informative, heartfelt, and the most comprehensive look at the 1981 USG election you’ll ever read. Entry filed under: University Park. Tags: Undergraduate Student Government, Wimpy the Gerbil. I loved Wimpy for president, which occurred during my time at Penn State. I worked with Fred in Student Auxiliary and thought it was so cool when I found out that he was tight with Wimpy!